Taking your blood pressure is simple with the M3 monitor. The M3 has a wide cuff (22–42 cm) that can be adjusted to suit a variety of arm sizes, and the cuff wrapping guide icon lights up when the cuff is wrapped correctly, allowing you to feel more confident about the accuracy of your results. The M3 is also equipped with a memory function that allows for two users to store up to 60 readings each. Accuracy as well as comfort is ensured with Intellisense technology, which always inflates the cuff to the peak pressure that is tailored to your own blood pressure level, ensuring a more comfortable measurement. Hypertension – what is blood pressure? There are approximately 16 million people in the UK with high blood pressure, however nearly two thirds are not aware of the fact, which is understandable when there are no symptoms. However, if left, high blood pressure can lead to strokes and heart problems. OMRON Intellisense is an advanced technology for blood pressure measurement. An Intellisense monitor inflates the cuff to the ideal level for each use, meaning that each reading has a personalised inflation level that is right for the user. Interpreting blood pressure results is difficult, and many people get confused as to whether their level is healthy. With the easy high blood pressure indicator, an orange light indicates whether your blood pressure is above the normal range. This helps you to interpret your results more easily. OMRON's M3 allows you to measure your blood pressure with ease and accuracy in the comfort of your own home in just a few steps. After positioning yourself and the cuff, it's simply a matter of turning the machine on, pressing start, and then recording the measurement. 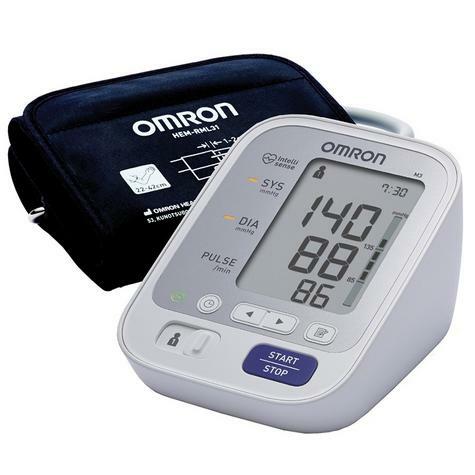 By developing state-of-the-art products that match high criteria in blood pressure monitoring technology, OMRON offers long lasting quality and accuracy. Typically, OMRON monitors are clinically validated, assuring you reliable readings. By taking steps to monitor and manage your own blood pressure, you can vastly improve the chances of greater long-term health and be able to provide your doctor with valuable information.